This product was added to our database on Friday 23 february 2007. 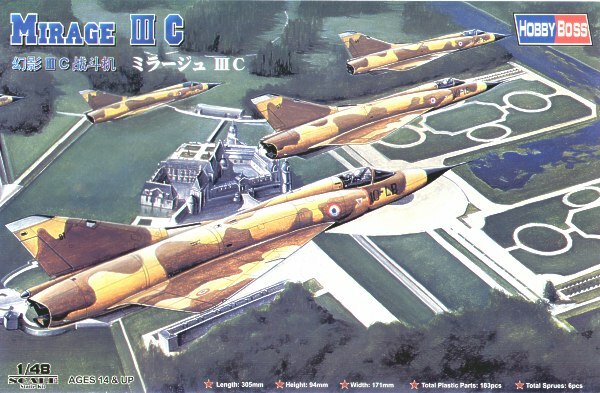 The Mirage IIICJ comes on 6 sprues with 172 light grey and 11 clear injected plastic parts. All the parts are clear of flash, but there is quite a few pin marks to be found on the kit. Most will be hidden on the finished kit, but a few can be found on the inside of the intakes and undercarriage doors. The kit has some lovely recessed panel lines and rivet details. The wings have separate flaps which have a textured rivet detail on them. The flaps don't look as though they are positional, but with a little work could be dropped. The tail fin and rudder is moulded onto the main fuselage halves, so reworking the rudder requires some surgery. The interior detail is fairly good, with all the gear doors having some great detail. The undercarriage bays are made up of several pieces each, with each panel having a nice touch of detail on it. Undercarriage legs are typical Tamigawa quality, but the front leg does look a little on the fragile side. The ejection seat is made up of 5 parts, but does not have any harnesses moulded on or as separate parts. The cockpit interior has a little moulded on detail in the form of raised dials and levers, and the same can be found on the instrument panel. There are decals for the instruments and possibly the ejection seat, but at no point in the instructions are you told to apply them. The external stores that come with the kit are 500L and 625L fuel tanks, MK 82 bombs, Sidewinder AIM 9D, Matra 530 C,K, Matra 530 E,M missiles and JL 100R rocket launchers. The MK 82 bombs look very good but deciding what weapon load you want will be a painful choice as they will all look pretty good sitting underneath the aircraft.